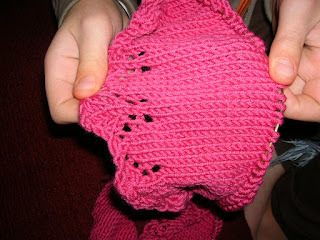 This is the hem of the baby jumper I'm making - my son consented to hold it out flat for the picture. Lovely, soft merino yarn. A delight to work with, but gosh, these 5 inches of plain knitting is boring! These are the Impossible Socks of No End. 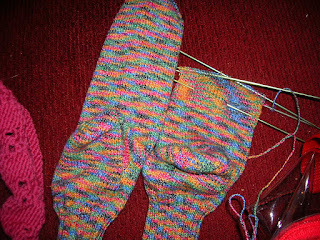 I started the ISONE's months and months ago and figure that, given another 10 years or so, I might eventually complete this second sock on impossibly small needles. My official pic of the day is this - I came home from work after just 3 hours, became a vegetable on the couch through 2 1/2 movies, then played Star Wars for a bit, blasting out little Lego Stormtroopers until I wore myself out. 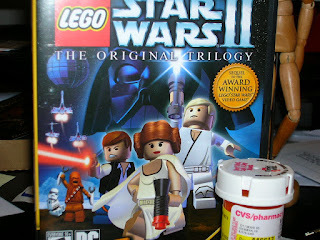 Beside the game of my obsession (and my son's, of course) is my bottle of antibiotics. I will beat this damn bronchial infection!